I’ve been so busy lately with all the traveling and catching up with work that I seem to be dressed down a lot these days. This is why it’s a welcome change to be in a tutu skirt and strappy heels once again, complete with hair and makeup from my shoot that day. Oh how I missed this. I’m clearly in my element. Of course, playing dress up wouldn’t be complete without a few twirls here and there. A tutu skirt and a pair of strappy footwear scream ballerina. How could I let this opportunity pass? I so love this outfit! my CellpHonE wallpapEr now! iba ka talagA Camille! Love love kita! Hi Camille, wow, creative combination! Could you please share what length you got your skirt in? Thank you! Hi Ms. Camille! I really adore this skirt! Can you please advise where to find affordable tulle skirt like this? Thanks in advance! Amazing outfit! I just love it :) You look gorgeous, Camille. Hi Ms. Camille! Just wondering why you have the same alexander grecco tulle skirt by Ms. Laureen? Is this a project of you two or something? Oh no, we both have the same skirt :) I guess Alexandra sent her one too :) It’s beautiful! Gorgeous! I love that fluffy tutu skirt. Beautiful look! Thanks Adrian! Love its fluffiness too! What? There’s no such thing as nonsense comments! :) I miss those shoes as well. Let me dig them out again! Thanks Rii! You must set an appointment with us already! :) Go go! I really love the combination .. different textures of fabric -perfectly match:) Good Job!! I loooove this skirt so much! J’aime beaucoup ton look, j’adore comment tu as assortie ces couleurs . Je trouve ça très subtil comme mélange de couleurs: tu as réussis a mêler un vert plutôt fluorescent avec un vert pastel sans pour autant créer une discorde de ton, ça reste doux et féerique. Fan. 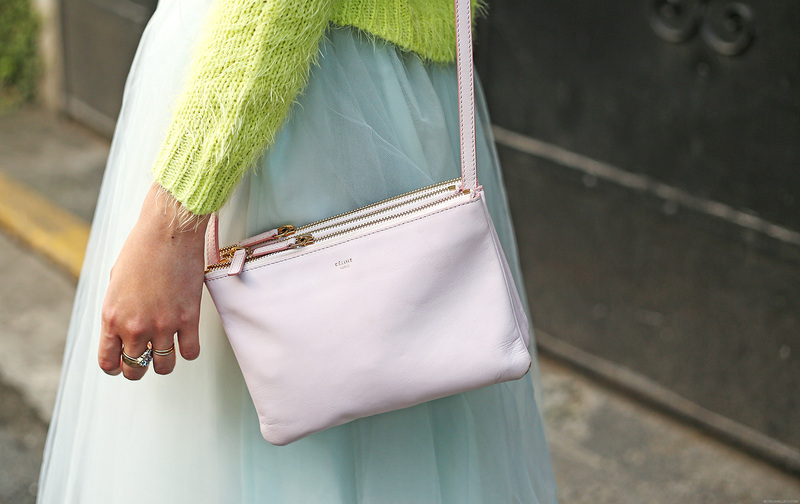 LOVE this pastel look!! Especially LOVE the skirt and shoes. A project :) Thanks Clariss! Woah! Seriously looking like a ballerina right there! In fact I just had a ballet performance this past weekend and I was wearing one of those tutus… Aha, you look stunning! Like so much the skirt! Wow, like your outfit, is so cool! !